Max the Brave (c) Ed Vere, 2014. Reproduced by permission of Penguin Books Ltd. 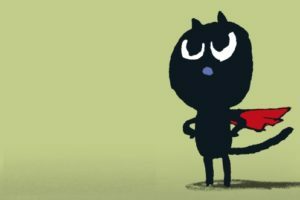 Ahead of our family picture book concerts, we caught up with the star of the show: Max the kitten, to find out a bit more about the cat behind the superhero cape. The highlight is yet to come… sharing the stage with Britten Sinfonia, I hear they’re not at all bad. I’m happiest when I’m chasing a mouse through a meadow on a sunny day. Being tricked by a mouse. Mice are devious and exceedingly cunning, I do not like them at all and I haven’t yet learnt all their wiles. Listening to Jacqueline Du Pre scratching away practicing Elgar’s cello concerto. I lived next door, she used to tickle me under the chin and feed me bits of fish, and I would give her much needed encouragement. I’m not sure if he’s still alive, if he is he’s very old, but I most admire Tom… such persistence, diligence and conviction to the cause. How he didn’t catch Jerry I will never understand. Most embarrassing moment? Why would I tell you that…? I don’t want everyone knowing. My most treasured possession is/are my remaining 8 lives (I’m counting that in the singular if I may). I lost one to the monster. I plan on hanging on to the others. What do you mean ‘would’? I have the gift of being a cat. What a remarkably strange question… Didn’t you notice that I’m a cat? No question, ‘Max the Brave’, it’s a true work of art, full of pathos and the dark comedy of life. How I’d love to meet the author. I hear he’s highly intelligent… highly! Near constant naps… but honestly, I don’t feel that guilty about them. Plenty of mice… but I suppose you’re asking about guests? In that case I’d invite the Britten Sinfonia… I don’t know if they’d eat mice though… What do you think? I’d go to Eygpt at the time of the Pharaohs… they worshiped cats… a highly intelligent civilisation! How do you relax away from the concert platform? Performing really takes it out of me… when I’m away from the concert platform I simply adore to shred the arm of the nearest sofa. My greatest achievement has probably been the tour de force of my acting in the 3 ‘Max’ books. A highly demanding role. For the first book I had to pretend I had no idea what a mouse looked like. I appeared entirely clueless, but with a dash of sophistication. As I said, a highly demanding role. Humility (as you will note from my last answer). In a nutshell, what is your philosophy? ‘Carpe mus!’ Which I believe translates as ‘seize the mouse’! Many thanks to author Ed Vere who was kind enough to translate Max’s purrs, meows and hisses into English.